How did the Hispanic ministry get started? We saw Spanish speaking people coming to church even 12 years ago. I would translate for them and then we would pray for them at the end of the service. Pastor Randy and another brother heard from God that we would need a service for these people. We started on Saturdays and very soon we reached 25 people, even though at times there was only one person. Those days we would pick up and bring brothers to church and take them back after service. We saw salvation, healing and deliverance from the beginning. We continue in faith because the Lord called us into this ministry and He manifested Himself. Some years later we changed the service to Wednesdays after 3 days of prayer and fasting. Soon afterwards we added a service on Sundays. That happened 6 years ago. The Lord has sent people from all over the world to help in the ministry, from Honduras, Mexico and now from Spain and Singapore, people who know the Lord and want to serve. What have been the most important moments in the ministry? Many people who have grown and have left because they were able to grow as a church. But we have discipled some people and we have seen people grow these years. At one point we had close to 100 people filling the Fellowship Hall in Bethel. We were told that we could use the main sanctuary at that moment to continue to grow. When did you receive the Word that the Lord was sending you from Bethel? When Mario Lara preached in June 2011 at SOS Ministries the Lord told me and to my wife at the same time that we would leave Bethel. I started to cry and stayed on the floor. I received a confirmation when an email after I preached on the Kingdom mindset. And the Lord told me about the church’s name “Casa de Dios” which I saw confirmed as I read the Bible. The Lord also told Bethel’s Senior Pastor Cris Liotta to start a new church. As soon as we made the announcement of this new church a couple made a big donation as a starting seed. That money has been used to register the name and do all the paperwork. The Lord has put us in touch with ministries such as Pastor Suan Gershon (Coat of Many Colors) from Houston who has helped us greatly in this process. He is the special guest for our launch. 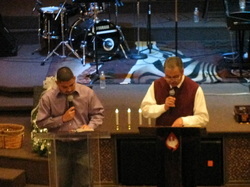 What is the vision of Casa de Dios Ministries? The ministry is not only for Bryan-College Station. It is more to be a blessing to the Valley. Do you remember how we used the media (press, radio, TV) to announce three days of revival in Bethel? We have also broadcast a service and prophecy over the Brazos Valley using Radio Alegria and the Eagle Newspaper. We want to be a blessing to the whole state of Texas, so we are praying about ministry in Houston and other cities. We also want to be a blessing to other nations. These nations will come from Texas A & M but we’ll also go to the nations. Last year we went to Singapore, Malaysia and Indonesia to minister in churches. This coming year we believe the Lord for open doors in Colombia and India. But we want mainly to see our cities transformed by the power of God. That the transformation affect our families, communities and nation. Are there any events that you have planned for this year? We are doing the launch and we’ll hold a conference on the Holy Spirit and the gifts of the Spirit. It is about the Holy Spirit and Fire. We’ll take that conference afterwards to other counties. The Lord has put us in touch with pastors from Africa, Europe and Asia. What type of training will be offered at Casa de Dios? We want to create a Bible School of the Holy Spirit. It will be an apostolic and prophetic center. What is the role of Casa de Dios for the city? The Lord has been connecting us with pastors such as Pastor Alaniz from Sanctuary of Praise, Pastor Gallegos from Shalom Church, JJ Ramirez from SOS Ministries to continue to pray and serve together in the city. We believe that more pastors will join in prayer and service for the city as it has been prophesied.